US star to perform five huge summer dates at her Diamonds tour hits major UK venues. Rihanna has announced a string of live dates across the UK in 2013 taking place next summer. Tickets are on sale at 9am, Tuesday 20 November. Full details below. The UK leg of the tour will start at Cardiff's Millenium Stadium, on 10 June, and take in Manchester, London and Birmingham before finishing at Sunderland's Stadium of Light on 20 June. David Guetta will be a special guest joining Rihanna for the London, Cardiff and Sunderland dates. The UK dates are part of the European section of the Diamonds world tour, which includes Barcelona, Spain and Paris, France - and is promoting Rihanna's recently released album, Unapologetic. The news follows Rihanna's earlier announcement this week of a London show, as part of her upcoming 777 tour. The ambitious dates will see Rihanna attempt to play 7 shows in 7 cities in 7 dates - hence the name - while partying with fans and journalists on a jumbo jet. Rihanna will be performing in London on the same date that the Unapologetic album is released, 19 November, so it promises to be an event to remember. According to Capital FM, the venues won't be announced until the day of the concerts. Rihanna: GQ covergirl as one of GQ's 'Men' of the Year. The 777 tour kicks off in Mexico City, on 14 November, and will hit Toronto, Stockholm, Paris and Berlin before the London date takes place, and the tour finishes in New York City. Ticket details for 777 have yet to be announced, but the Diamond tour tickets are going on sale on Tuesday 20 November next week at 9am. Check out the UK tour dates below. For more information visit Gigwise Gig Tickets. Rihanna's 777 tour is soon to see her perform concerts in 7 cities and 7 days. Taking in London, New York and Paris - amongst others - Rihanna's describing it as shaping up to be a "a rock n' roll adventure" - and unlike anything we've seen before. David Bowie's Glass Spider tour involved - unsurprisingly - a 40' diameter spider above the stage. 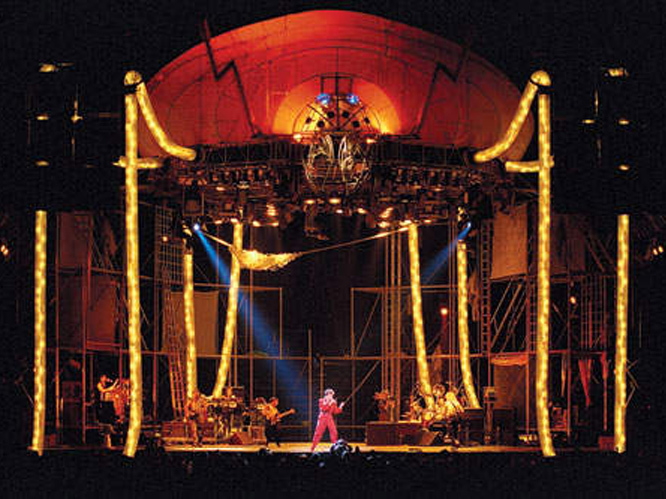 It also included scaffolding on multiple levels for dancers to perform on, and Bowie would emerge from the top of the spider's head for the encore. Fabulous. Madonna's Drowned World tour was the highest-grossing concert tour of 2001 by a solo artist, and the most theatrical. The show was divided into five segments; Neo-Punk, Geisha-Anime, Country-Western, Latin-Spanish and Urban-Pimp. Madonna arrived on stage in a 'spaceship', and there was an aluminium tree, mechanical bull, and a spinning 3800lb chair all included in the show. She certainly doesn't do things by halves. Crazy concert tours wouldn't be complete without Lady Gaga. It was difficult to decide between Monster Ball and Born This Way Ball, but in the end the former had to win. The Monster Ball Tour became the highest-grossing tour by a debut headlining artist, and one of the highest-grossing tours of all time and included both an original concept and later, a revamped one. Subway cars, orbit balls, see through nun habits, fire and giant gyroscopes... and that was just the start of it. U2's 360 tour was the actual highest grossing tour in history - and just look at that stage design. 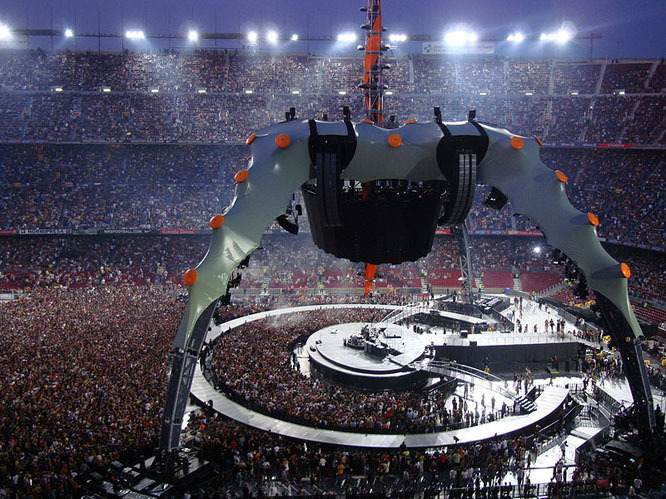 'The Claw' held a cylindrical video screen, allowing fans to see no matter where they were, and the stage had no defined front or back and was surrounded by the audience. 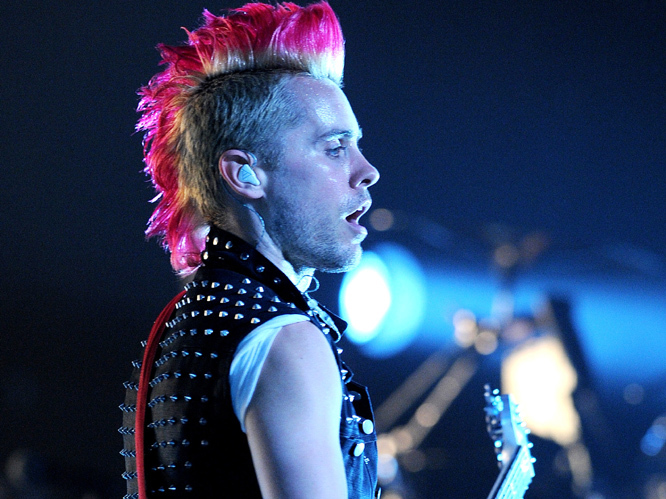 Innovative and crazy, this tour marked a definite moment in rock history. Muse are known for their constantly impressive set designs, but The Resistance Tour was the one that really outdid them. The band members were on three pillars which moved up and down, and based the design on George Orwell's 1984. Matt Bellamy also wore an LED suit - but would you really expect anything different? The Rolling Stones are another one of those bands where every tour could be a contender, but we decided to go with the Bridges To Babylon tour - and just look at that stage prop. The band used four giant naked inflatable women on the tour which were meant to embody four of the Seven Deadly Sins, and created a crazy Baroque environment. 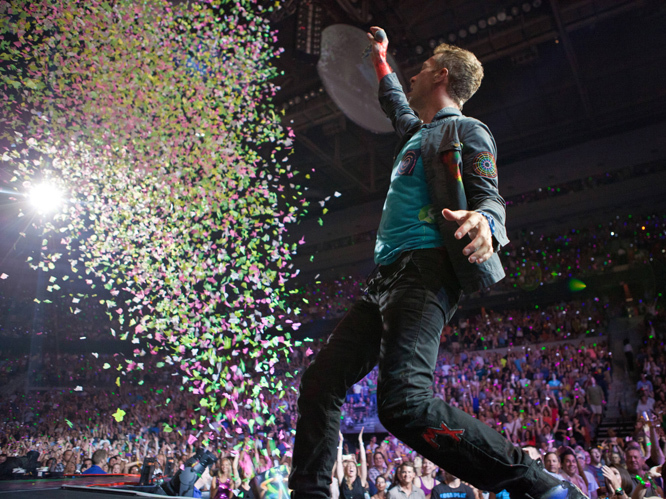 Who can forget Coldplay's infamous light up wristbands? The best part of the bands, which were given out on the so-called Mylo Xylotour, was that some of them would still light up after the concert. It led to this great quote to The Independent in which Clive Banks, co-founder of RB Concepts said: "There's no mind control or tracking, they are just for fun." 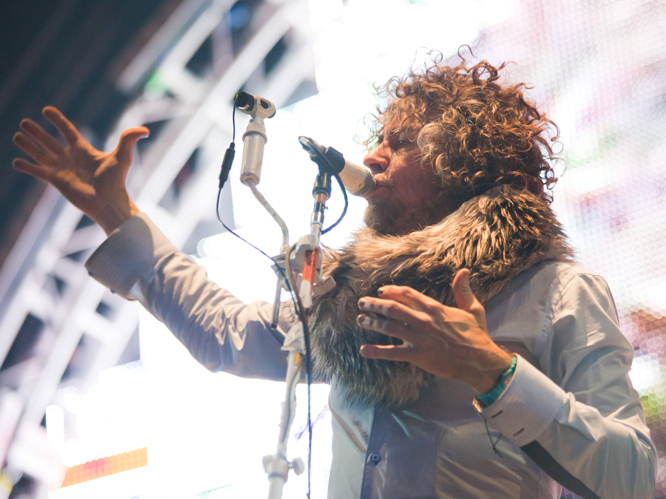 And finally, The Flaming Lips round up our tour list, after their short tour which saw them perform the most live concerts in multiple cities in 24 hours. The band played eight cities and performed for at least 15 minutes in each one, from 27 to 28 June 2012.